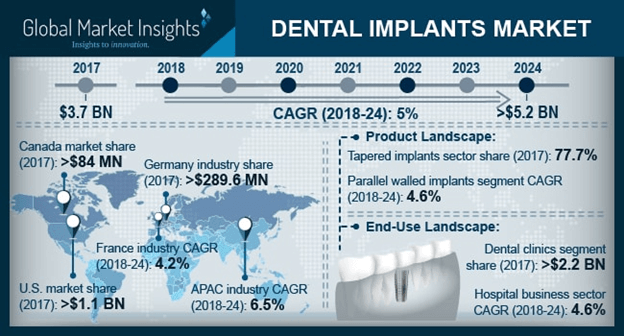 Dental Implants Market size is set to exceed USD 5.2 billion by 2024; according to a new research report by Global Market Insights. Rising prevalence of oral health disorders such as tooth decay, periodontal disease, and dental caries across the globe will act as a primary driver for global market growth. Approximately, 10-15% of the total population in the developed countries are suffering from severe periodontitis. Poor oral hygiene, smoking, diabetes are major risk factors associated with periodontitis. Such factors will stimulate demand for dental implants over the forecast period. Rapidly growing geriatric population base with tooth loss in developed regions is another major factor driving the market outlook. Developed countries such as U.S. and Germany have huge edentulous population that increases the demand for dental implants among elderly base to replace their missing teeth. Presence of supportive awareness programs such as ‘MaxiCourses’ launched by American Academy of Implant Dentistry (AAID) with an aim to educate practitioners on implant dentistry will fuel industry expansion. Rapid advancements in implant technology along with increasing demand for cosmetic surgery and dental implants to improve esthetic appeal will favor industry growth. Excessive cost associated with dental implants coupled with limited reimbursement policies in developing countries will hamper business growth. Tapered implants segment dominated the overall market with a share of over 77.5% in 2017 and is expected to show a similar trend in the future; this is attributed to advantages offered such as primary stability, maximum bone and soft tissue attachment. Titanium implants market segment valued USD 2,644.0 million in 2017 owing to its biocompatibility along with increasing usage for the fabrication of dental implants. Zirconium implants will grow at a rapid pace in the coming years owing to increasing demand for metal-free implants along with its aesthetic superiority over other implants. Dental implant business in clinics held the largest revenue in 2017 followed by hospitals. Advanced technologies offered in multi-speciality hospitals will boost the demand for dental implantation surgeries in such facilities thereby propelling segmental market size over the coming years. France market is estimated to grow at 4.2% CAGR over the forecast period due to rising elderly patient pool suffering from oral health disorders in the country. Furthermore, presence of industry players focused on dental and regenerative implant dentistry will augment regional market size. Canada market was valued over USD 84.0 million in 2017 and is forecast to grow at a rapid pace in the coming years. Favorable reimbursement scenario for dental implants along with rising number of people with tooth loss will foster market size. For instance, Oral and Maxillofacial Reconstruction Program covers 100% of treatment costs for surgical placement of dental implants in Ontario should increase adoption rate of dental implants in the country. India market will grow at significant 7.4% CAGR over the forecast period due to increasing awareness and growing concern for oral hygiene coupled with rapidly surging geriatric edentulous population in the country. Rising dental tourism in India owing to cost-effective and affordable treatment will accelerate industry growth. Some of the key industry players operating in global dental implants market are Straumann Group, Dentsply Sirona, Henry Schein, Danaher Corporation, Zimmer Biomet, and Osstem Implant. The industry players resort to merger and acquisition along with new product launch to expand their market foothold in the industry.